The 15MW Sunshine Coast Solar Farm in Valdora powered by Trina Solar panels is on track to be fully operational by mid-2017. The Sunshine Coast Solar Farm enables the local Sunshine Coast Council to become Australia's first local government to offset 100% of its electricity consumption across all its facilities and operations from renewable energy. The farm, which is solely owned by the Council, is expected to save the organization up to $22 million, after costs, over a 30-year period based on today's cost of electricity. 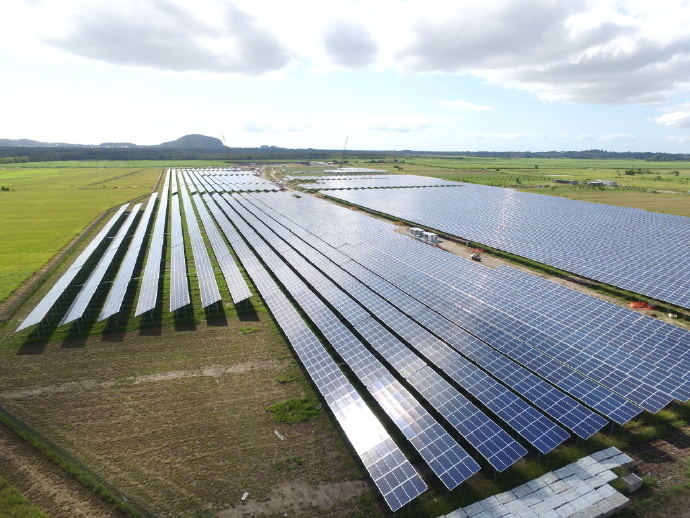 Downer was awarded the contract to Design, Construct, Operate and Maintain (DCOM) the Sunshine Coast Solar Farm and appointed Trina Solar to supply 57,000 pieces of Duomax PEG14 315W PV solar panel modules. The farm is the country's fifth largest installed solar plant and is built on 24 hectares in Valdora which is exposed to high winds and extreme weather conditions such as cyclones. To mitigate this, the Duomax module was selected due to its robust mechanical properties that can withstand extreme weather conditions. It has consistently topped industry performances and its warranty fulfils the 30-year design life planned for the solar farm. Duomax has unique module architecture utilizing double glass and a frameless design that enables improved product reliability and performance. The product is specifically designed to improve project Levelized Cost of Electricity (LCOE) driven by its lower degradation rate and enables Balance of Systems (BoS) savings at system level, making it a preferred choice for developers. Ms. Helena Li, President, Asia Pacific and Middle East, Trina Solar said: "It is our great pleasure to once again work with Downer to deliver a milestone for the Australian utility industry - the Sunshine Coast Solar Farm is one of the first projects to be delivered at the 1500V rating system. We are proud to have played a part in helping the region transition into a clean energy economy." "We're pleased to continue growing our relationships with partners like Trina Solar to deliver large scale renewable projects and continue our leadership in the renewable energy sector," said Trevor Cohen, Executive Director, Downer Utilities. At its peak, the Sunshine Coast Solar Farm will generate 15,000 kilowatts of electricity from the sun. This will supply power to the local Council's administration buildings, aquatic centers, community and performance venues, as well as holiday parks, libraries, art galleries and sporting facilities. The electricity generated over one year is enough to power about 5000 homes.